The Divisional Round of the playoffs is often looked forward to as the best weekend of the NFL season, as it is the last time we get to see two playoff games on both Saturday and Sunday. Saturday kicked us off with a blowout in Kansas City followed by a Cowboys comeback attempt in LA that ultimately fell short. Sunday brought us another one-sided performance in Foxboro followed by the game of the weekend – a nail-biter down in New Orleans. There were many impressive performances between the four games, with many coming from banner players that PFF has identified all season in this space or via our All-Pro Team. There were also some impactful performances from lesser-known role players on the game’s biggest stage. Next week the stakes are even higher as the final four teams, the top four seeds, look to overcome the penultimate hurdle before having the chance to be anointed Super Bowl LIII Champions on February 3rd. 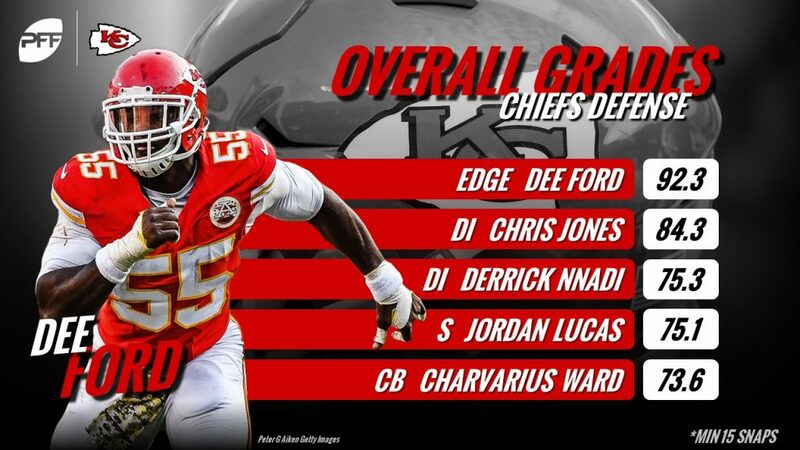 Ford came on strong in 2018 and has been the centerpiece of a potent Chiefs pass rush all season. The pending free agent led all edge defenders with 77 pressures on the season, after averaging 29 pressures per season over his first four years. On Saturday, Ford was a menace. On his 26 pass-rush snaps, he finished with five total pressures, breaking down to one sack, two hits and two hurries. He also chipped in two run stops on his 10 run snaps. The relatively underrated interior defender continued his upward trajectory this season and finished 2018 with a PFF second-team All-Pro nod. He was a consistently dominant force all year long, setting an NFL record with a sack in 11 straight games in the process. As another contributing member of the KC pass-rushing triumvirate (along with Justin Houston), Jones continued his effective play against the vaunted Colts offensive line on Saturday. Despite not gathering any sacks, he finished the day with four total pressures (three hurries and one hit), and he got in the throwing lanes to bat down three Andrew Luck passes at the line of scrimmage. 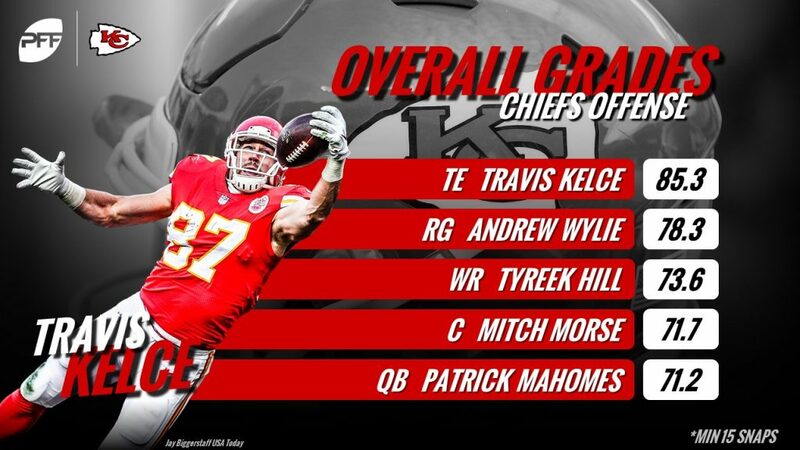 Travis Kelce also earned himself a PFF second-team All-Pro nod for his play this season, leading the league’s tight ends in receiving yards from the slot and yards per route run for the slot. Kelce had one of his best games of the season on Saturday, hauling in seven of his nine total targets for 104 yards. On the day, he lined up in the slot on 40.0% of his routes, and he hauled in four of his five slot targets for 52 yards. Key Signature Stat: 94.6 Pass-blocking Efficiency. All five starters graded positively during Saturday’s dominant group performance, with the highest grade belonging to veteran Andrew Whitworth, who didn’t allow any pressures and absolutely mauled in the run game. As a result, Jared Goff sported the second-lowest pressure percentage of the weekend, only being pressured on 17.2% of his dropbacks. The offensive line as a whole was credited for allowing only two hurries on the afternoon (with two more coming from running backs and tight ends). Key Signature Stat: 11.8% Run Stop Percentage. 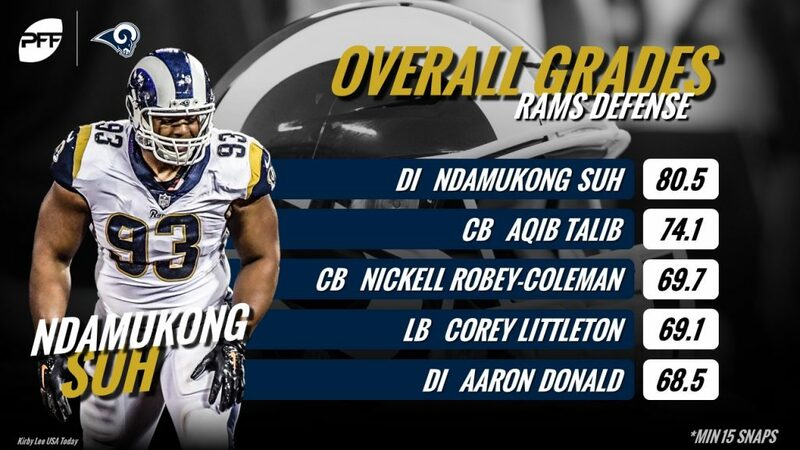 Suh set a high standard for himself over his eight seasons before joining the Rams this year, but he’s continued to show himself as a plus-player in LA, finishing with an overall grade of 81.6 in the regular season. While the Dallas offensive line mostly did a good job stymieing the Rams’ pass rush, Suh came to play in front of a star-studded crowd in LA. He finished the day with two defensive stops on 17 run-defense snaps and four total pressures (two hits and two hurries) on 30 pass-rush snaps. There were many standout performances from the Pats’ offense on Sunday, and between Gronk’s blocking, James White’s receiving, Sony Michel’s running and Tom Brady’s accuracy, New England ran away with this game from the opening drive. However, Julian Edelman came through time and again for Brady, doing most of his damage in the slot. Edelman finished the season as the Patriots’ highest-graded receiver and ran 67.0% of his routes from the slot, totaling 550 yards, the tenth-most leaguewide. On Sunday, his slot route percentage was 61.4%, finishing with seven catches on eight targets and compiling 118 of his 151 total yards. Kyle Van Noy started every game this season for New England, playing 91.2% of their defensive snaps, but finished with a mediocre 65.4 overall grade. The fifth-year veteran saved his best performance for the divisional round, making his presence felt in run defense, in pass coverage, and as a pass rusher. Van Noy had four stops (two against the run, two against the pass), three hurries, and one pass deflection while allowing only three of the eight passes in his coverage to be caught for 22 yards. Michael Thomas finished 2018 as a PFF First-Team All-Pro and with the second-highest grade among receivers. He was the third-most efficient receiver in the league, sporting a 124.5 WR rating. He again proved his ability to do it all on Sunday, finishing with 16 targets on his 40 snaps in route (14 in the slot). He caught his single catchable deep pass for 42 yards, and he turned his sole end zone target into a two-yard touchdown reception. Fifty-four of his 171 yards came after the catch. Lattimore’s play dipped slightly in 2018 compared to his superb 2017 rookie season, but his play seemed to turn the corner after an inconsistent start, highlighted by the first Saints and Eagles matchup in Week 11 when he allowed only eight yards in coverage and intercepted Carson Wentz. With the Saints trailing 14-0, Lattimore’s second-quarter interception of Nick Foles will be earmarked by most as a turning point in Sunday’s game as it led to an 84-yard touchdown drive for New Orleans. Shadowing Alshon Jeffery towards the end of the game, Lattimore put the game away with his second interception of the afternoon in what was a memorable performance. Key Signature Stat: 0.67 yards allowed per coverage snap. The third-year man plays almost exclusively as a slot cornerback and lined up there on 33 of his 36 coverage snaps on Sunday. LeBlanc got things going in a hurry, picking off Drew Brees on the first play of the game, intercepting a deep pass that was intended for Ted Ginn Jr. While he did get tagged for the two-yard Michael Thomas touchdown, he only allowed 24 receiving yards (4 catches/7 targets) and a 64.0 passer rating on throws into his primary coverage. Two of his tackles were third-down stops that kept the Saints short of the chains.